The US up until Bush, Jr has been the driving force behind the World Economy. I warned that the USA peaked in 1999 and that we would begin to see a decline that would result in the fragmentation of the USA at the end of the cycle. 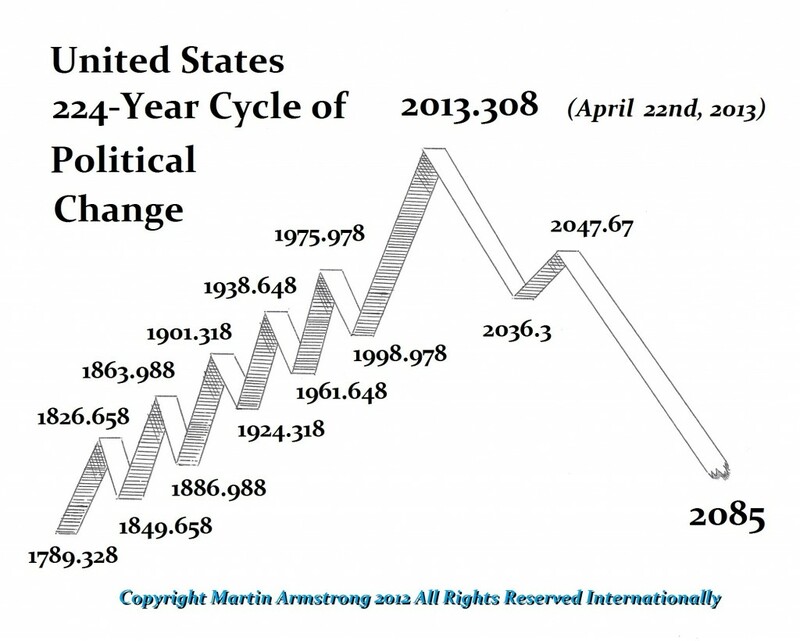 However, the cycle of Political Change on the USA peaked in 2013. On April 18th, this is when the confrontation between Obama and Putin began as he tried to gear-up for war to get a pipeline through Syria to compete with Russia. Syria was then accused of using Chemical Weapons. The model turned April 22nd, 2013. It was also April 2013 when North Korea’s Kim Jong-un, despite stiffer sanctions from the UN, announced plans to expand his nuclear weapons and strengthen the country’s economy. So much for sanctions working there. Nevertheless, Obama has been implementing sanctions against Russia, but Obama’s pattern of complete disaster in foreign policy is repeating yet again as Europe is suffering an economic implosion and Obama has dealt a serious death-blow to the GDP of Europe particularly in agriculture. The golden rule in France – never mess with its farmers. The sanctions against Russia are backfiring on the US and history is repeating as to how the United States will collapse. It appears the very same mistake that led the arrogance of Athens causing all its allies to abandon it and some actually turned and aided Sparta in killing the Athenian Empire is unfolding before our eyes. Indeed, as Athens did not consider the welfare of its allies and imposed whatever was best exclusively for itself at their expense, Athens lost its allies and support. 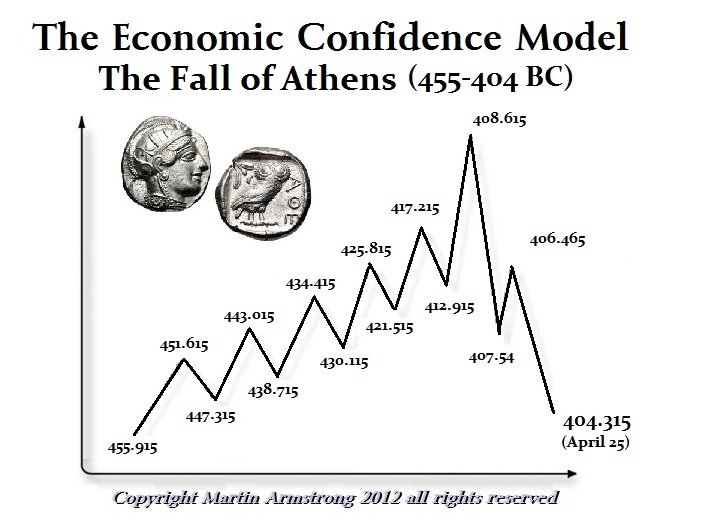 The last 2 years turned into a phase transition that became self-evident in its coinage. The Athens Owl, the cornerstone of world commerce like the dollar today, ended as effectively a bronze coin that was silver plated between 406-404BC. Athens lost all support and its ability to mine silver. I have warned that the NSA inflicted a very serious and deep wound against American Allies. I have warned that the Obama sanctions were not going to play out the way he had intended. Nobody seems to ever ask have sanctions ever worked even just once. It is the same play-book over and over again without results. France is bankrupt. It hates America and still suffers from the loss of Waterloo and had they won that battle, many still believe the world would be speaking French rather than English. By France needs Russian natural gas. Total SA, France’s largest energy company, has just announced that the company is seeking $27-billion financing for a gas project in Russia, the Yamal LNG project, ignoring the Obama sanctions against Russia. They will not use dollars and are looking to finance the project in euros, yuan, Russian rubles, or any other currency but US dollars to avoid being prosecuted based on dollar transactions. Total SA is relying on the Yamal project, which is expected to start in 2017, to provide a big chunk of the company’s production growth. Obama’s sanctions reduce Total SA to a broker for US energy companies. The US claims it can supply the gas to Europe and attacking oil field in the Middle East claimed to be in control of ISIS, will further expand US oil exports as well. Obama seems to be bought and sold by to the energy companies. Total SA is moving for its own survival, but Obama is arrogant precisely as was Athens and he cannot see the trend right before his eyes.